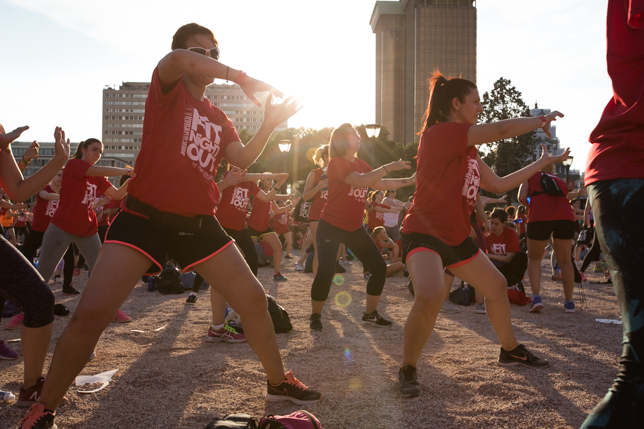 The sun was scorching as 4,000 women descended on Madrid’s Plaza de Colon for FIT NIGHT OUT on June 2nd 2017. The event was organised by Women’s Health magazine as a way for women to come together to celebrate health and wellness in a party atmosphere. Guests could enjoy a range of gym classes such as Zumba, Bikram Yoga, Body Balance and more; there was a photo-call opportunity with model and actress Vanessa Romero; healthy snacks and drinks to fuel the active part-goers by Thins, and of course, a hilarious, action-packed GIF making station. GIFGIF is the perfect photo technology for international events as it is compact, quick to set-up and easy to travel with. GIFGIF takes hardly any time to build on-site and the fun can start within minutes. It is completely addictive and had queues all night long. The buzz for the event was incredible as women travelled from all over Spain to support each other in a great cause. GIFGIF was incredibly popular all night long as groups of women wanted to make a GIF with their besties. As well as GIF’s guests could take away a print out from the event within a branded FITBIT frame.